Our closest star is Alpha Centauri is just 4.37 light-years away. Alpha Centauri is not just a star it is a solar system that contains three stars Rigil Kentaurus, Toliman and Proxima Centauri. Rigil Kentaurus is just like our sun a spectral class type G star. Toliman is a class K star orange to red color. 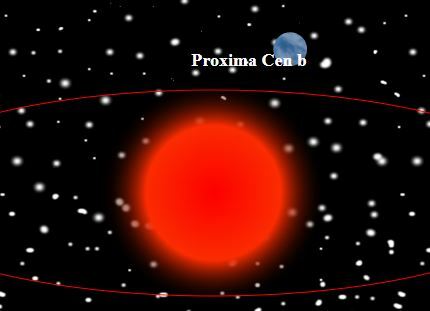 Together they form a binary star system, Proxima Centauri is a small and faint red dwarf and is closest to our sun. Proxima Centauri has an Earth-like exoplanet in the habitable zone Proxima Centauri b. The planet was discovered in August 2016 by ESO Very large telescopes. It was discovered by the wobble method. Just like other planets orbiting red dwarfs Proxima b is tidily looked. It is the eternal day on one side of the planet and night on the other side. The planet does not transit its star and that makes it difficult to get any reliable information about the planet atmosphere and composition. But there is a chance that the planet has an ocean and an atmosphere. Red dwarfs are known to have deadly radiation that could have a negative effect on life. As the star is just around the corner 4.2 light-years away could we travel to the planet and look for aliens? The New Horizons probe, which lifted off in 2006 on a mission to Pluto and the Kuiper Belt moves at a speed of 84000 km / h it will only take us 54 thousand years to reach Proxima b at that speed. The photoelectric effect that Einstein got his Nobel prize for in 1921 is also based on this phenomena. Where light shining on some material it will cause emission electrons. This effect is proportional to the frequency of the light f=c/λ. Where the energy is E=hc/λ and the momentum p =h/λ, where λ is the wavelength of the light and h is a universal constant called Planck's constant 6.62607004 × 10-34 m2 kg / s and c the speed of light in a vacuum. Breakthrough Starshot initiative is planning to send hundreds or even thousands of nano crafts. The technology is not developed yet and it is very difficult to make the sails hold. Russian billionaire Yuri Milner and other investors have paid $100 million to cover the first 10 years of development. So it is not just science fiction it could be possible in a near future. Peter van de Kamp was a professor of astronomy at Swarthmore College from 1937 until 1972. Already in the forties, he was looking for exoplanets. He gave lectures on the topic do stars have planets for astronomers groups in the fifties. In 1963 he made a big announcement, that he finally found an exoplanet. A large jovian was orbiting Barnard star with an orbit on 25 years. Barnard star is the closest single star system from earth only six light years away. Only Alpha Centauri a system that consists of three stars and a habitable exoplanet is closer. Barnard star is a very small red dwarf, with only 0.14 the mass of the sun and 15% of the sun's radius. Barnard's star is also a very fast moving star, the fastest on the sky, and in 10000 years it will be the star that is closed to our sun. The claimed discovery was made with the wobble method, de Kamp detected with his instruments that it was a periodic distortion in the star motion. Over decades he took thousands of images of the star. Making these measurements this was very hard precision work as the shift in the blurry light of star was tiny as a sand corn, This discovery was, of course, a big sensation at the time de Kamp appeared in many big newspapers and in television shows. Later he also discovered another Jupiter sized planet orbiting the star with an orbit of 12 years. Later some skeptical voices about these discoveries were raised from the science community. Astronomer George Gatewood analyzed de Kamps photos and could not make the same conclusions. Other planet discovered around other stars by de Kamp had an identical change of motion, and the anomaly often occurred after the lens was removed or cleaned. Decades later much better instruments could not make the same discoveries as de Kamp did. The discoveries were not real it was errors made with the instruments and in the analysis of data. Van de Kamp did not accept that his life work was wrong and kept defending his research and started to repeat his measurements. Van de Kamp died in 1995 at aged 93 he never found an exoplanet. The first confirmed detection of Exoplanets was a couple years earlier in 1992. Peter van de Kamp was not really completely wrong about Barnard's star it probably does has a planet. Last week on 14 November 2018 Ignasi Ribas team at the Institute of Space Studies of Catalonia and the Institute of Space Sciences, CSIC in Spain. Announced that after careful studies that with 99 percent certainty there is an exoplanet orbiting Barnard star. The planet that was discovered with the wobble method lies around 0.4 astronomical units from the star. The planet is a cold icy super earth with a size 3.2 times earth. The planet is called Barnard’s star b, and with mean temperatures at -170 C, the planet is likely not habitable. 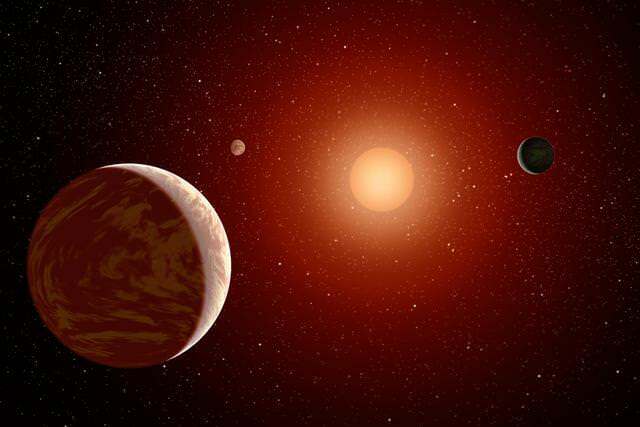 The planet is still not classified as confirmed exoplanet more analysis needs to be made to 100 percent rule out any natural stellar variations. There are also indications that there are other planets further away from the star. 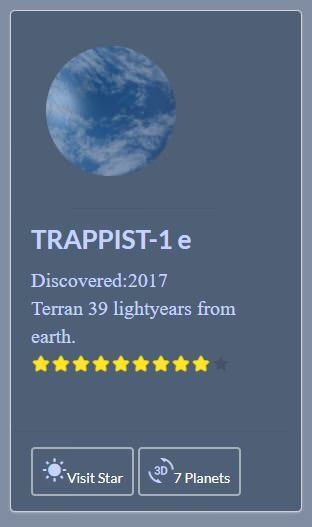 In the constellation, Aquarius 39 light years away is one of the most important exoplanets system discovered so far, Trappist one. The solar system has not just one earth-like planet but seven and four of them are in the habitable zone of the star. The discovery was announced on 22 February 2017. The planets were detected using the transit method as they pass in front of their sun it is possible to measure a recurring decrease in sunlight over time. The planets are very small and the star is bright so it is a very tiny amount of light we are talking about. The scientist was using very advanced instruments to make the discovery. Spitzer Space Telescope and the Very Large Telescope was amongst the telescopes used. The light is filtered around the atmosphere of the planet and the molecules will make the light shift in color. That will give information about the composition of the planets. Trappist one is a very small brown dwarf just slightly larger than Jupiter but much more massive. The planetary system could also in size be compared with the moon system of Jupiter. The planets are very close to each other. All the planets are orbiting closer there sun than Mercurius and the planets will sometime look larger than the moon and the sky of their neighbor planet. Perhaps aliens of Trappist 1 d is colonizing Trappist 1 e if they have the same technology in space travel like us. As the planets are rotating near its sun there are in a tidally locked orbit with one face pointing toward the sun all the time. It is daylight all the time on one side and night all the time on the other. Trappist-1b is in the same size of earth but is very similar to Venus with a very thick atmosphere and it is very hot at the surface. Trappist-1c the heaviest planet in the system and is also very similar to Venus. It is a rocky planet with a thick atmosphere and too hot for life. Trappist-1d is the planet that has the largest ESI value amongst the exoplanets. The planet has also a high SPH index, which means that it likely to have vegetation. The planet has a thin atmosphere. It could be enough to keep the climate stable as the planet not rotating around its axis. The planet has about 250 times more water than earth. Trappist-1e is also very similar to earth it could have liquid water. The zone between day and night is suitable for life. If the planet has enough atmosphere a larger part of the planet can be habitable. Trappist-1f same size as the earth but not as dense. The planet has much water but in a gaseous state. The planet is likely not habitable. Trappist-1g both radius and mass similar to earth and a stable climate. Water has been detected. The planet is cooler than earth but could be habitable. 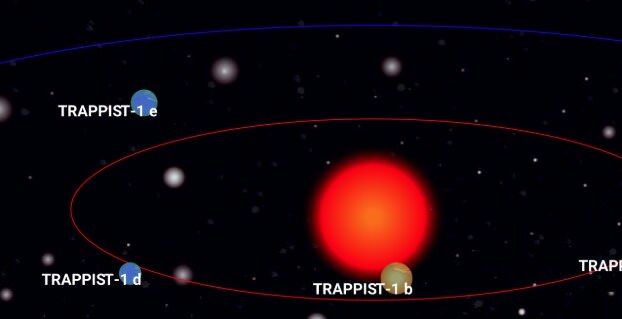 Trappist-1h the smallest planet in the system with a size between mars and earth. Could contain water and has a temperature similar to the south pole. The planet is outside the habitable zone of the star.